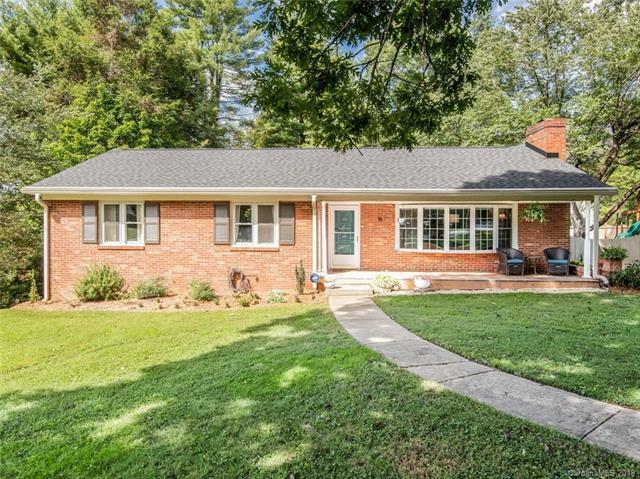 Mid century brick rancher located in desirable, established neighborhood just 10 minutes from downtown Asheville. Sited on a gracious corner lot on quiet street w/ large trees and a sunny fenced in yard perfect for kids, pets, gardening. The large front porch welcomes you into this charming home with beautiful wood floors, a wood burning fireplace, bay window in the light filled living room, vintage bathroom and a screened in / glassed in back porch with ceiling fan. Head downstairs to find a private space with its own entrance, ideal game / play room, quiet yoga spot, or income producing homestay (application for permit in process with City of Asheville). Tons of updates and improvements since 2016 (ask broker for complete list), include new roof, heat pump, fence, fixtures, etc. Beautiful place to call home. (Basement ceiling height just under 7 feet - including 3rd bath and laundry. Not included in overall square footage) Owner is licensed NC real estate broker.